Cusco is some 1000 km. (621 miles) over road (via Nazca and Abancay) from Lima, and at an altitude of 3300 meters(10800 feet) above sea level), and can be reached by car over good roads via Nazca, Arequipa, Puno and lately from Brasil through the jungle (new road via Puerto Maldonado), by plane also from Lima, Arequipa, Puerto Maldonado, Juliaca and La Paz (Bolivia), or by train from Juliaca/ Puno. 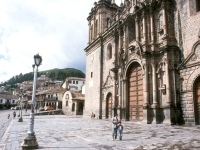 Cusco was till a few centuries ago the most populated city in the Americas. Nowadays it is still a great and beautiful city with lots of attractions. Though the Spanish demolished much of the walls and buildings of the original city, there are still amazing ancient walls standing strong. 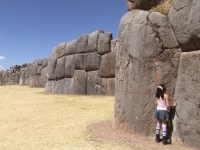 The name Cusco in Quechua means "Navel of the World". Cusco's central square, called the "Plaza de Armas" (like most central squares in peruvian cities) becomes a fascinating spectacle at night. 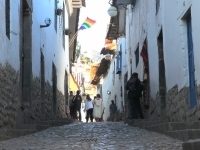 We find steep and cobbled streets that seem frozen in time, especially in San Blas, the artists' neigbourhood that is going upwards from the Plaza de Armas. Small restaurants, called "picanterías" (specialised in spicy food) and chicherías (bars serving chicha, a kind of maize beer made of fermented purple maize), we still find between the more turistic and international food serving restaurants. 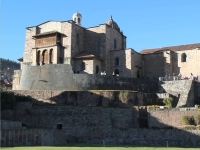 Cusco is the oldest still populated city in South America and here and there Inca walls (or walls from even before Inca time) have survived, despite of the arrival of the Spaniards in 1533 and the earthquakes of 1650 and 1950. Additionally, the Plaza de Armas sits on what was Huacaypata (meeting place or weeping place); the chapel of Triumph and the cathedral, built with blocks that were thrown down from the famous site of Sacsayhuaman, on Suntur Wasi (House of God) and the Palace of Inca Wiracocha; the church and the convent of Santo Domingo on Koricancha (the Sun temple); the Archiepiscopal Palace built on top of the palace of Inca Roca; the temple of the Jesuit Church on top of Amarucancha, the palace of the Inca Huayna Cápac, and the church and convent of Santa Catalina on Acllahuasi (House of the chosen). Although the wounds are now closed, they are not completely healed; when listening to the local guides' descriptions of the excesses and looting to which the people were subjected have left deep scars. For this reason there's always room for the pride and assertion of a glorious past, which led to the renaming of streets like Triunfo with the Quechua name: Sunturwasi (House of God). 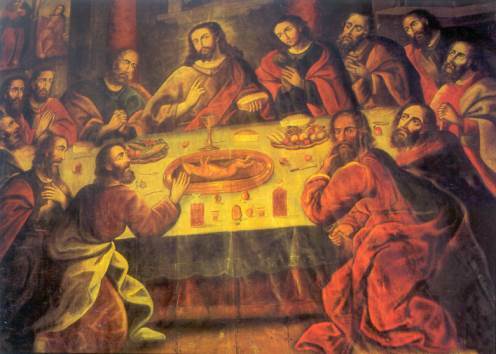 Despite of this past, the colonial buildings have their attraction, the cathedral with Marcos Zapata's magnificent painting of The Last Supper, for example, in which the 13 dishes are adapted to local foods like guinea pig. (click for bigger image). 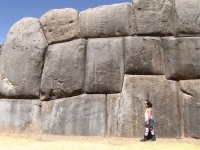 Just outside and above Cusco, a few kilometres away, there is Sacsayhuaman, supposed to be an Inca site, but there is controversy between official and alternative viewpoints on the magnificent, huge scale and high precision stonework that one can observe there. It is the place where the Spaniards almost lost the battle for Peru and where the festival of Inti Raymi (Festival of the Sun) is celebrated every year on June 24th. There is much more to present from Cusco, and we will inform you here more and more gradually increasing in time.